Another couple of card kits I made up!! These are from quite a ways back and were discovered while I was looking for something else in a box which was packed during our move!!! 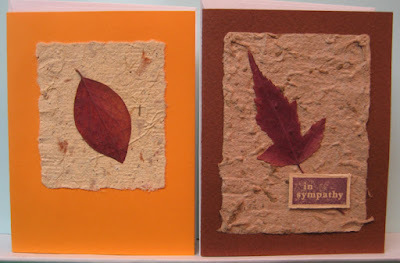 I used white glue to adhere the pressed leaves to the handmade paper which I made myself and then adhered this layer to a colourful card. I added a distressed stamped greeting to the one on the right. Loving card kits for cards that are ready in minutes! !